The buzzword of the year? Big Data. IBM tells us, “Everyday, we create 2.5 quintillion bytes of data.” Well, that’s nice, but so what? How do we turn data into information? And how do we make that information meaningful? 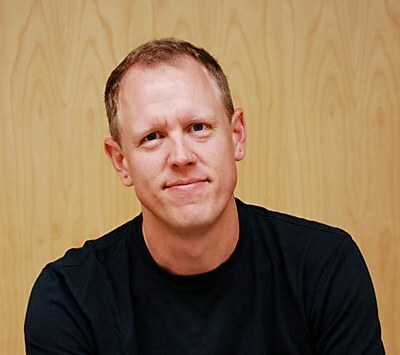 The answer, according to the designers and developers at Tomorrow Partners, is Sparkwise. Sparkwise is a free, open-source web app designed expressly for nonprofit organizations that visualizes their data in an elegant online display. As Gaby Brink, founder of Tomorrow Partners, explains, “Sparkwise helps nonprofits measure the impact of their work, engage with their communities and share reports with funding partners that illustrate how their support has made a difference.” The impact dashboards Sparkwise creates help social entrepreneurs transform data locked in spreadsheets and visualize it for greater clarity and insight. Thanks to Sparkwise, Brink says, “Funders get to see live numbers and quality data that reveal the impact their investment makes.” Plugged into a website, Sparkwise can track data from social media campaigns, aggregate data from open data sets and combine that data with good old-fashioned storytelling techniques and video clips. The result: data invested with emotion. Emotion backed by data. In other words, by making every data point part of a story, Sparkwise makes information that matters. 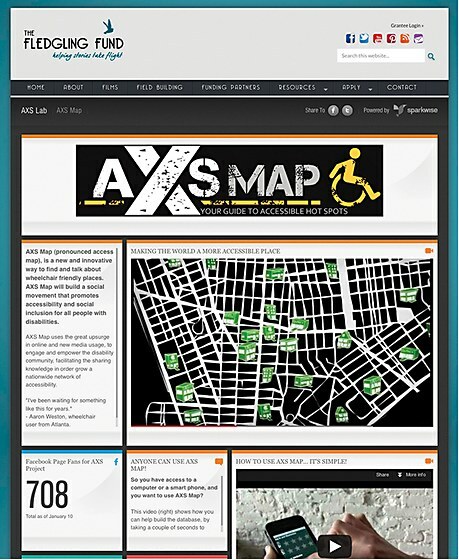 AXS Map is a part of a social movement designed to share information online about accessible places for people with physical disabilities. The Sparkwi.se impact dashboard tracks social media activity and puts video introductions front and center. Sparkwise is taking off around the world. By last count, there were more than 3,000 organizations using Sparkwise to create impact dashboards. 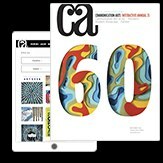 These range from major foundations, research institutes, universities and NGOs, to documentary filmmakers, museums, public broadcasting agencies, civil rights organizations and churches. The Fledgling Fund, a nonprofit dedicated to supporting the work of crusading documentary filmmakers, thinks Sparkwise is so crucial to its mission, it requires every one of its grantees to post a Sparkwise impact dashboard. During those five years our culture became increasingly connected, increasingly wired, and with every button click, e-mail, text, tweet and like on Facebook, we collectively generated a tsunami of data. While business intelligence software used our own data to turn us from surfers into customers, Levy thought there might be away to use data to turn people into change makers. That’s where Tomorrow Partners came in. Building on the initial funding provided by the MacArthur Foundation, the Ford Foundation, the Wyncote Foundation and the Fledgling Fund, Brink, chief strategist Nathalie Destandau, user experience designer Carl Bender and software developer David Karam worked on Sparkwise for eighteen months, with the research and Alpha test phase supported by a grant from the Bill & Melinda Gates Foundation. Their ultimate goal was to “open hearts and minds supported by real data,” according to Levy. Like the best software, Sparkwise protects its users from having to learn code. By employing a series of readymade widgets, each with its own built-in intelligence, Sparkwise makes it simple to get started. Connect a widget to an account at Facebook, Twitter, YouTube or Google Analytics, drag it onto your board and the widgets go to work, gathering data and automatically displaying it. Data visualization options let you display your data as numbers, percentages, pie charts, heat maps and more. Comparison widgets provide trend-tracking capabilities. Story widgets include the ability to add video, along with explanatory content that puts the numbers in perspective. Call-to-action capabilities are included that enable users to download a PDF, participate in a survey or fire off an e-mail. These engagement widgets turn passive viewers into participants enabling them to become part of the story. Widgets are dragged and dropped into any position on a dashboard, resized according to impact and grouped according to theme. By incorporating infographics, logos, slideshows and videos, a Sparkwise dashboard conveys a rich sense of purpose beyond raw data. To share a dashboard, users simply publish a dash-board to a publicly viewable URL, or embed the dashboard as part of a website. When it comes to Sparkwise, seeing is believing. While many of the impact dashboards created by Sparkwise are private, it is possible to see Sparkwise at work on the Barefoot College website. Located in a rural village in India, this nonprofit is dedicated to improving basic issues such as drinking water, education for girls and sanitation in the developing world. The new website was designed by Amplifier Strategies, who sent a production team to India to help Barefoot College tell its story to the world. 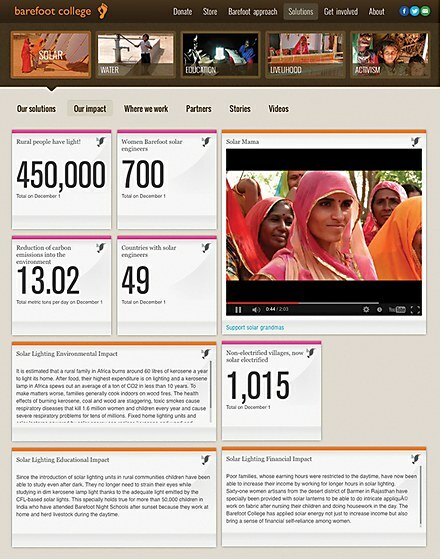 Every data point tells a story on the Barefoot College Sparkwi.se impact dashboard. Thanks to the Barefoot College Solar Mama project 700 engineers in 49 countries have electrified 1,015 villages providing light to 450,000 people. Meagan Fallone, a senior advisor at Barefoot College, invited Amplifier Strategies to India with an agenda. In two weeks, PBS would air Solar Mamas, a documentary that followed Barefoot College’s attempt to bring solar electricity to poor villages around the world. The goal was ambitious. But the methodology was even more audacious. The Solar Mama project planned to bring illiterate mothers to India, train them as solar engineers, and six months later send them back to electrify their home villages. Barefoot College needed a website. And it needed to show the impact of this project. Fallone suggested Amplifier Strategies use Sparkwise to create an impact dashboard. According to Chantal Buard, creative director at Amplifier Strategies who spearheaded the development team on site at Barefoot College, working with Sparkwise was “easy, and straightforward. 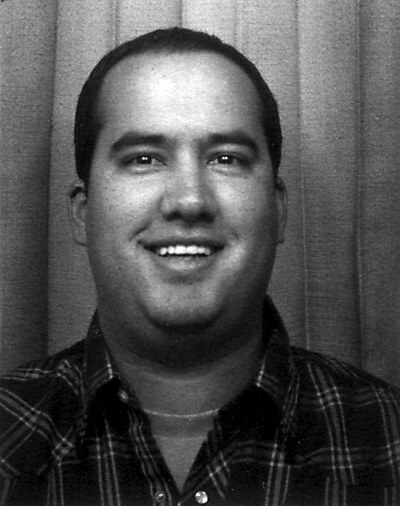 You enter social media log-in information, define the social media metrics you want to track, add content and boom, it comes up on your site.” It’s an all-in-one solution “that’s easier than following along using a handful of different aggregation tools,” Buard says. Designer Brent Couchman notes the bizarre pairing of faux-3D graphics with sports and that great design usually means tons of hard work. T.J. Tucker speaks about the Texas Monthly redesign.